Engine repairs in Raleigh/Durham for your Mercedes, BMW, Audi, Porsche, Land Rover, Mini, Volvo, VW, Lexus and Toyota. It’s like a dealership at your location but affordable. Are you looking to get your vehicle’s engine repair done on-site at an affordable rate and in a timely manner? If so, then you’ve come to the right place. Proficient Auto is Raleigh’s top choice for engine repair. The best part is that we send a certified ASE mechanic right to your front door. We offer the highest quality service without breaking the bank, so you can save for the more important things in life. So, what are some signs you may need your vehicle’s engine repaired? Although that last one may be the most obvious one, it doesn’t always mean you need an engine repair. The certified and experienced mechanics at Proficient Auto will perform a diagnostic on your vehicle to ensure it’s indeed your engine, and not something else. We pride ourselves on being prompt, reliable, honest, and affordable – which aren’t usually the qualities you’d expect from an auto shop, but we’ve got them. Above all, we’re convenient as we’re just a click or call away from being at your doorstep. Hassle free engine repairs with peace of mind at your home, office, or side of the road. For more information, or to schedule your Raleigh Engine Repair, call us today at (919) 675-AUTO or fill out our fill out our contact form. Raleigh Vehicle Repair believes in honesty and transparency as well as offering top-notch service to all our clients to create long-lasting relationships. 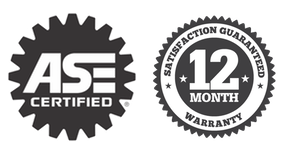 We offer a 12 month or 12,000 mile warranty on all parts we supply. This is our “Peace of Mind” promise to you. In a hurry for your car repairs? Excellent, honest work! I hired Proficient Auto when two other “shade tree” mechanics led me to believe that I needed to replace my engine for $2,000. After Erik sent me a reasonable quote, Jason came to my house and discovered the problem was an ungrounded wire. Imagine how much more I would have paid for a new motor I didn’t need. When I thought I needed new brakes, Tim came to my house and diagnosed the real problem, again saving me costs I didn’t need to incur. If you want reliable, friendly mechanics who tell you the truth from the start, Proficient Auto is your team. They’re a small unit, but they get the world done without breaking your wallet. I have no desire to go to a brick-and-mortar shop again.